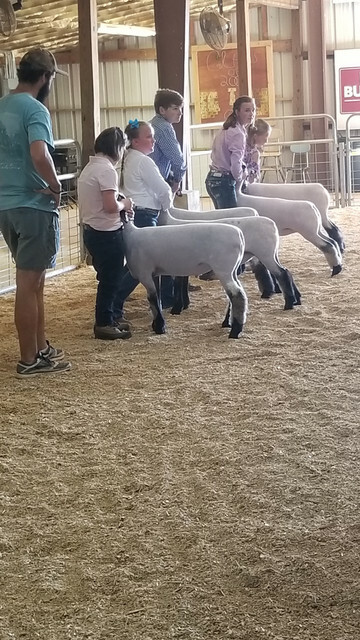 Thought I would post a couple pictures from my daughters lamb show this weekend. Georgia Clay--Looks good, congratulations to your daughter. Brings back good ole memories of the 1950's when I was in 4-H and showed beef cattle. Hope she gets Grand Champion!!! I don't know a darn thing about lambs or sheep (except what Mike has shared with us) but I do know what I like and that is a beautiful animal. It is wonderful to see kids still having an interest in raising a baby animal. And I would be remiss in not giving you credit for raising a child that knows what work is. Well done Georgia clay. Thank you everyone, I agree kids are raised very different these days. You guys will be glad to hear that this year is the biggest class of livestock exhibitors we have ever had in Ag and 4-h. I thought your pictures showed quite a turn-out. That is always great to see.